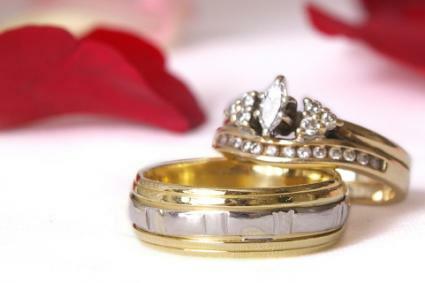 Diamond engagement ring settings are the mountings which attach the diamond to the ring's band. In order to choose the most attractive setting, you'll need to know what styles are available and which ones suit the bride's hand; just like different brides-to-be, each setting has a unique personality and style. There are as many varieties of settings as there are brides-to-be. While the basic types are described below, there are endless variations of even simple designs, and custom settings can also be created to suit individual preferences. 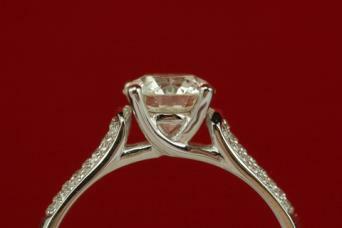 Initially designed in 1886, the classic prong setting is the most popular option, especially for solitaires. 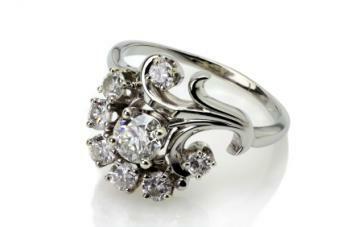 The diamond is set in a metal basket and secured with three or more prongs or claws, making it appear to hang. Prong settings allow for the most light to enter the diamond and be refracted, increasing the diamond's sparkle. This setting is also easy to clean. Prong settings are very secure for larger diamonds, but may not be the best choice for smaller diamonds because the stone may appear lost or overshadowed. 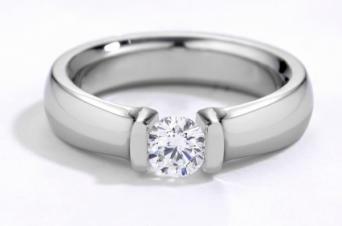 When choosing a prong setting, six prongs is the most desirable number for security and symmetry. The disadvantages of prongs include the tendency to get caught on hair and clothing. 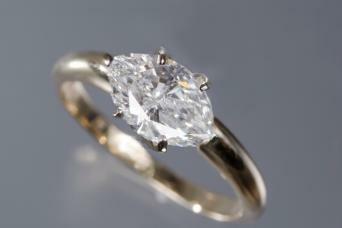 Furthermore, thin prongs may be easily bent or twisted, increasing the chance of losing or damaging the diamond. A cathedral setting is unusual due to the center diamond being mounted in a unique position. 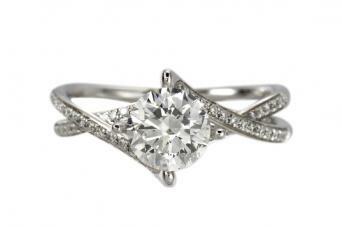 The diamond in a cathedral setting is set in a high arch mount that frames the entire ring. It is called a cathedral setting since it mimics the arches seen in cathedrals. 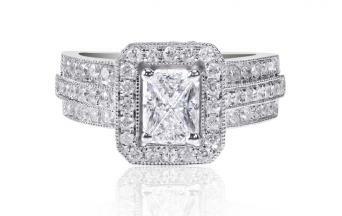 This type of setting can be done with either round or princess cut diamonds. This is an extravagant setting that will attract attention and stand out when worn. A bezel is a metal band that wraps around a circular diamond to hold it in place. There are also partial bezels, which only surround the sides of the stone. Bezel settings provide good protection and are known for their durability. 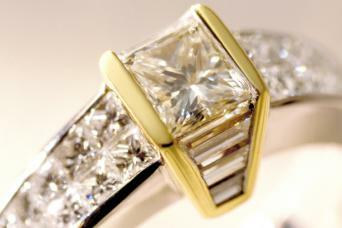 The metal can also accentuate a diamond, making it look larger than it would in a prong setting or covering minor flaws. Bezels also provide a very smooth surface unlikely to snag on hair or clothing. The disadvantage of bezel settings is they are usually more expensive than prong settings. A flush setting is made by creating a tapered hole in which the diamond sits with the surrounding metal pressed around its rim. Unlike bezels, the metal does not fold over the top of the stone. This offers good protection for diamonds and a smooth, sleek surface. Flush settings provide a very tailored, contemporary appearance. The danger of flush settings is that if done improperly, they can easily loosen and the stones may be lost. Tension settings are created with ultra-strong metal, using the band of the ring itself as the only method of holding the stone in place. 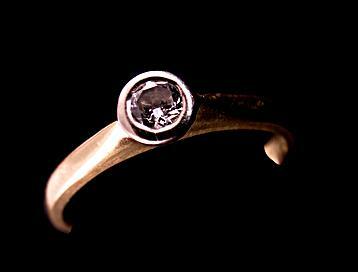 Small grooves are carved into the edge of the band where it intersects the stone for added security, but the result is the startling appearance of a diamond held in midair. Tension settings are quite expensive because they must be individually sized; the ring cannot be resized without losing the necessary strength to protect the stone. Channel settings are very popular for accent stones or simple rings, such as eternity rings, that lack an overall center stone or single focal point. Diamonds of similar size and shape - frequently round or princess cuts - are lined in a channel inset into the ring's band, with a narrow strip of metal along the sides to hold them in place without prongs or bars between them. Because the stones are inset, this is a very secure setting option, but it does not highlight the gems as well as elevated settings do. An invisible setting is a very modern option where the stone is bound to the ring without any immediately visible means. Typically, the setting involves a stable cup the stone can rest in, and that cup is then attached to the band in a bypass or split design. 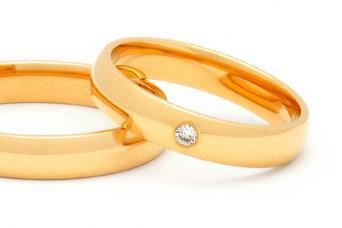 The effect is similar to a tension setting but the ring can be resized without difficulty. 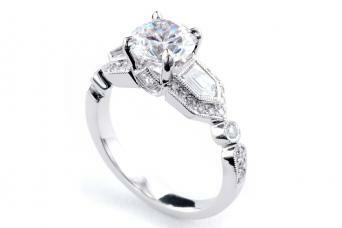 Because of their exquisite elegance and beauty, pave setting engagement rings are becoming increasingly popular. This design literally coats the entire surface of the ring with gems, each set into either a minute depression or secured with thin, unobtrusive prongs. Due to the sheer number of diamonds necessary to create this design, pave settings can be very expensive, but many couples opt for cubic zirconia or other synthetic stones to cut costs without sacrificing the luxury of the design. A cluster setting is designed to present multiple stones - often semi-precious gems rather than diamonds - in a figural design, such as a flower or butterfly. Another cluster option is to use many small stones to create the illusion of a larger gem without the expense of a single stone of higher carat weight. This setting is one of the more unusual ones. Its uniqueness is due to the position of the diamond. Instead of being set in the traditional way which is North to South, this setting places the marquise diamond in an East to West position. The result is spectacular and gives the marquise cut an entirely different look. Some engagement rings offer two or more settings on a single ring, usually with the center stone highlighted above smaller accent stones. Because of the intricacy of these multi-settings, they tend to be more expensive. More common designs, however, such as a central prong setting flanked by channel-set accents, can be found, and may be a more affordable option. Most settings are made of platinum because it is stronger than gold, and its white hue will not tint stones or decrease their color value. When examining a setting, test each stone to be sure it is secure and that there are no unsightly or uneven gaps. 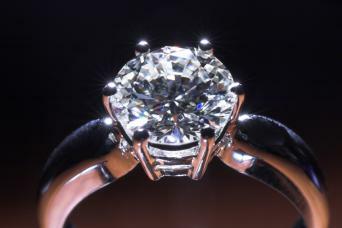 Stones should sit level in the ring, and the contact points of the setting should be attractive and symmetrical. With a bit of consideration and knowledge about different ring settings, it is possible to choose a variation that expresses personality, beauty and elegance just as much as the diamond it holds. Whether the bride-to-be prefers a traditional prong arrangement or a more unusual cluster or bar setting, choosing a quality piece will ensure a quality ring for years to come.